After decades of crushing Roman rule, the Hebrew people are losing hope. When will the promised Messiah come? Into the midst of this turmoil, young Mary is told she will bear God's son. 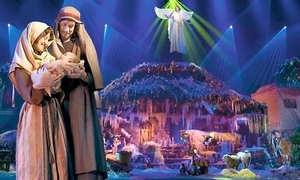 Angels in heaven proclaim his birth; humble shepherds and regal kings pay him homage. Clearly this is no ordinary child! But who is he - really? Is he the Messiah, our Savior? Who can even believe such a thing! Witness the story that is central to the season, brought to life with high drama, awe-inspiring special effects and live animals. Rejoice with your whole family as the true meaning of Christmas unfolds right before your eyes!